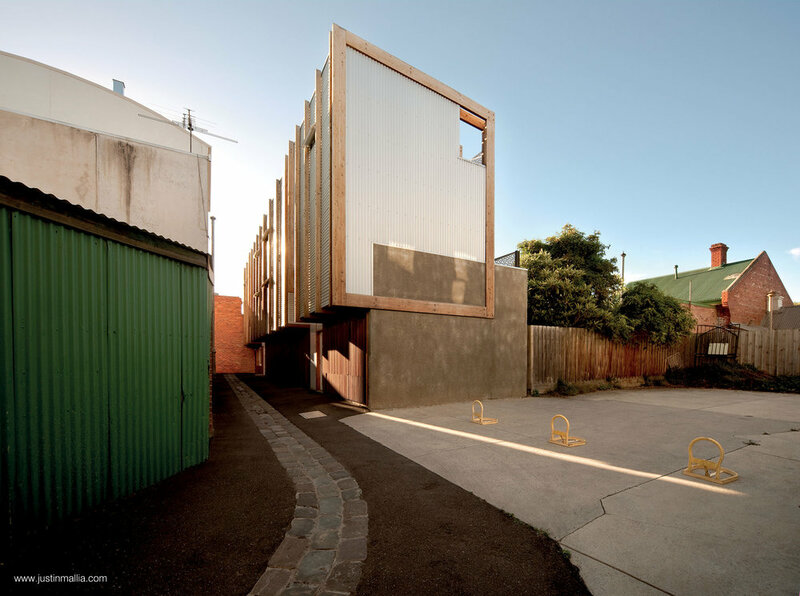 Yan Lane is a new street located in the inner city of Melbourne, Australia. Undertaken on a small budget, this scheme was conceived as an opportunity to use architectural understanding to drive a development project to meaningfully infill an otherwise ignored space and to achieve financial return. 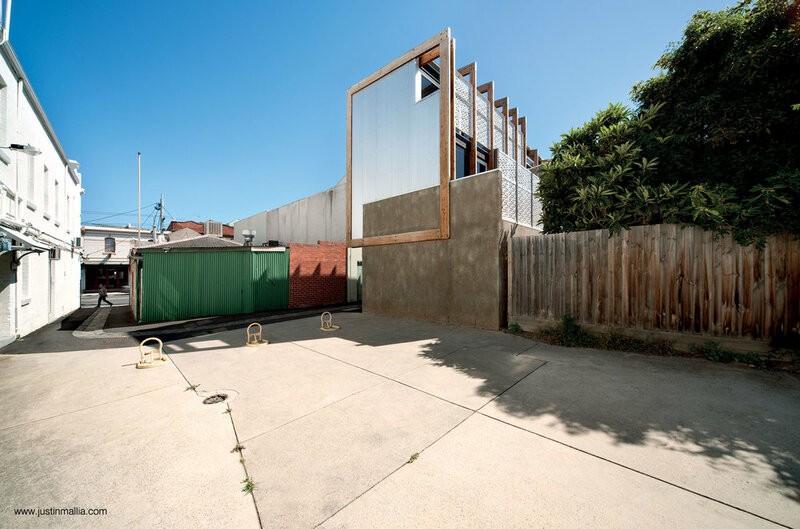 The project involved the subdivision of a narrow sliver of land with no street frontage and hidden between the rear face of shops to the south and the backyard fences and sheds of houses to the north. 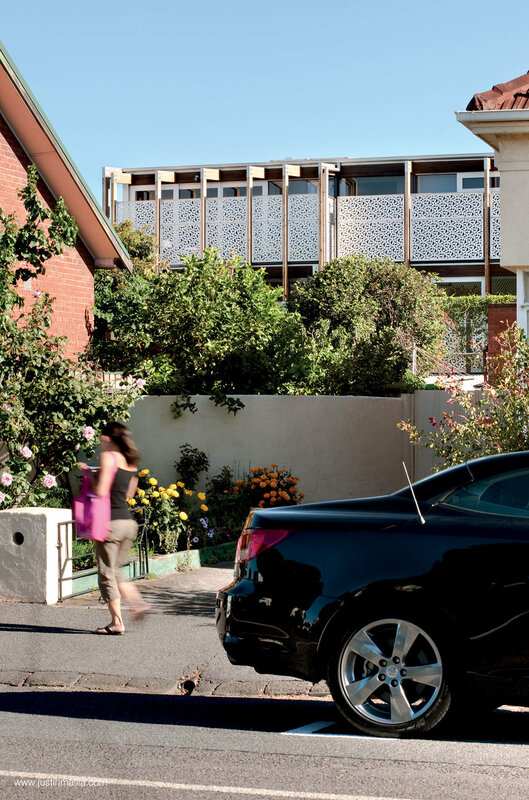 Yan Lane is primarily the creation of a new building incorporating two houses but reaches beyond the scope of the small site to include the extension of services infrastructure from the main road and the recreation of a right of way to form a new street. The project creates an activated, human place from what was previously disused and neglected. In response to diverse and complex surroundings the two houses are simply presented as a single building. 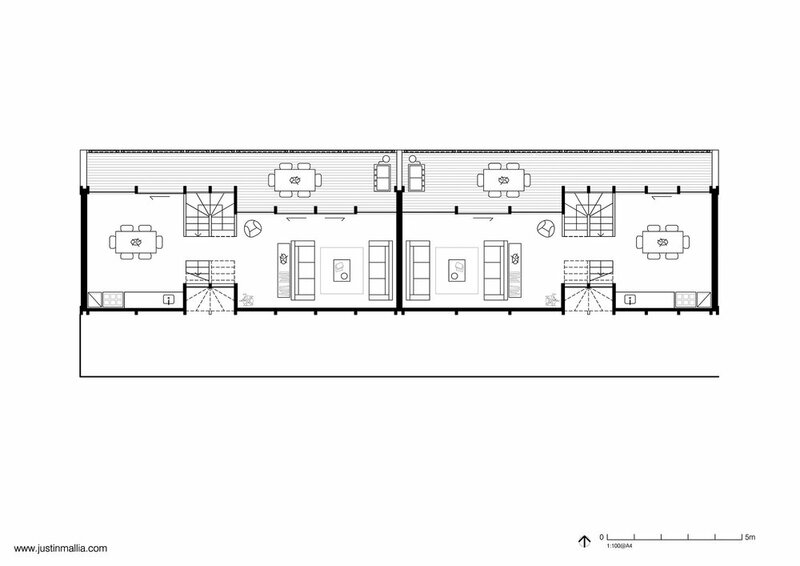 In order to be accessible and occupiable, the form of the building contorts itself in response to the dimensionally tight parameters of the site through a stepped sectional profile. Each face of the building is assembled with different materials and performs differently to interact between its immediate external context and the internal spaces it encloses. 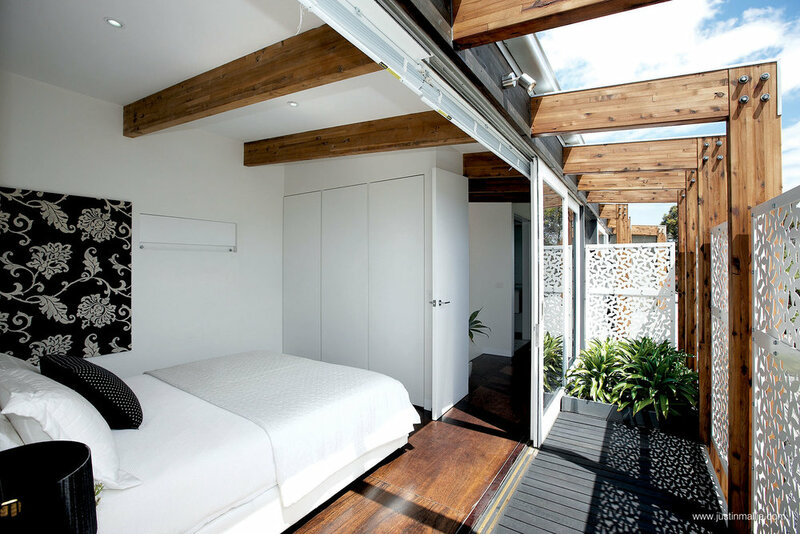 A repetitive structural timber frame is exposed as a consistent organising principle throughout this assemblage. It conceptually stitches the facades together creating a cohesive whole. Towards the noise and clutter at the back of the adjoining shops, the south elevation presents itself in a simple unified manner through the repetition of the expressed timber columns set on a solid zincalume backing. 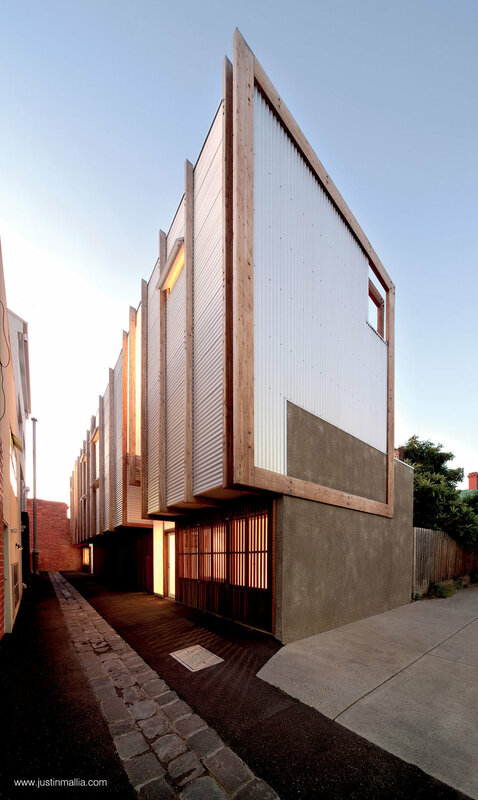 The building can open up to engage with and enliven the laneway or it can close down to a seamless, simple façade. 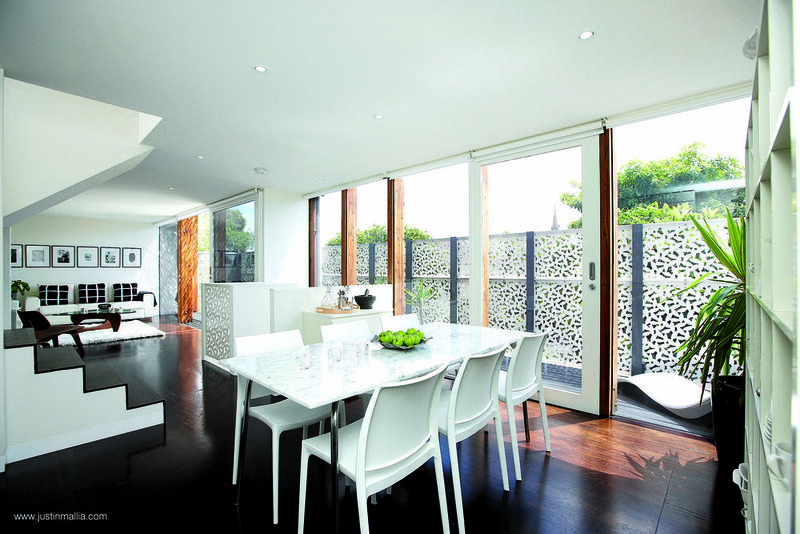 Towards the light, tree canopies and residential character to the north, the envelope is set back from the structural frame enabling it to be openable with wide sliding doors and becoming a deep occupiable space through a layering of extensive customised screens, terraces and planting. The facades are flexible allowing permeability to be mediated depending on the day, to suit the weather or the way the spaces are occupied. The building is energy efficient, carefully detailed and tactile. 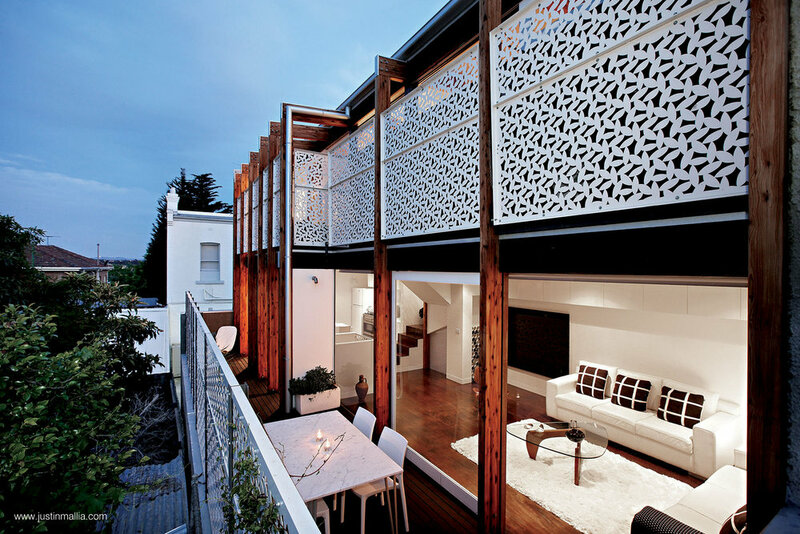 It is a surprising encounter of light and tranquillity in an otherwise gritty urban setting.